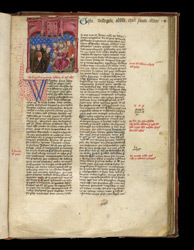 This manuscript contains a collection of writings and documents that relate to St Alban's monastery. It begins with a series of histories, including one about its late 8th-century founder, Offa, king of Mercia, and includes accounts of the life and miracles of St Alban, the first Christian martyr of Britain in 304. Mostly made up of documents and administrative material, it would have combined monastic reference-book with promotion of its role in Britain's Christianity. After the accounts of history from the birth of Christ and of St Alban's martyrdom and miracles, the 'Acts of the Abbots of the Monastery of St Albans' relate the history of the monastery itself, from its first abbot, Willegodo, to Thomas de la Mare. Matthew Paris--the monastery's 13th-century house author who was the foremost medieval English Chronicler--wrote the earlier part and Thomas of Walsingham--precentor and in charge of the scriptorium at St Alban's--compiled the rest. The 'Acts of the Abbots' begins with a picture of Offa, surrounded by his court, giving the abbot's staff to Willegodo. It envisions the 8th-century monks as late medieval Benedictines and the Mercian king and court in contemporary dress.